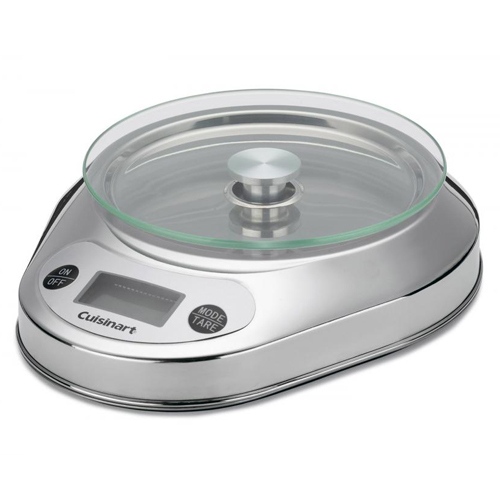 The Cuisinart KML-KO3B PrecisionChef bowl digital kitchen scale delivers accurate measurements for all your favorite recipes and has a smart design for convenient storage and display. It features a removable stainless steel measuring bowl that has gradient marks for easy measuring and inverts as a protective cover for a sleek countertop display. The KML-KO3B is uniquely shaped for spill-free transfers of wet and dry ingredients allowing Items to be weighed in the bowl or directly on the glass platform. It's add 'n' weight feature allows you to weigh multiple ingredients without starting from scratch and large LCD readout offers accurate readings in imperial or metric mode. The scales signature black and stainless styling blends seamlessly into any contemporary kitchen. The Electronic Kitchen Scale Precisionchef Bowl Digital has many exciting features for users of all types. See the Electronic Kitchen Scale Precisionchef Bowl Digital gallery images above for more product views. The Electronic Kitchen Scale Precisionchef Bowl Digital is sold as a Brand New Unopened Item.